The first Mini Cooper was the word "mini" defined. The second gen car was a little bigger, but still fairly mini. The third one stretched that definition a good bit. And now we have a new Mini. It's larger on the outside and smaller in a key area. 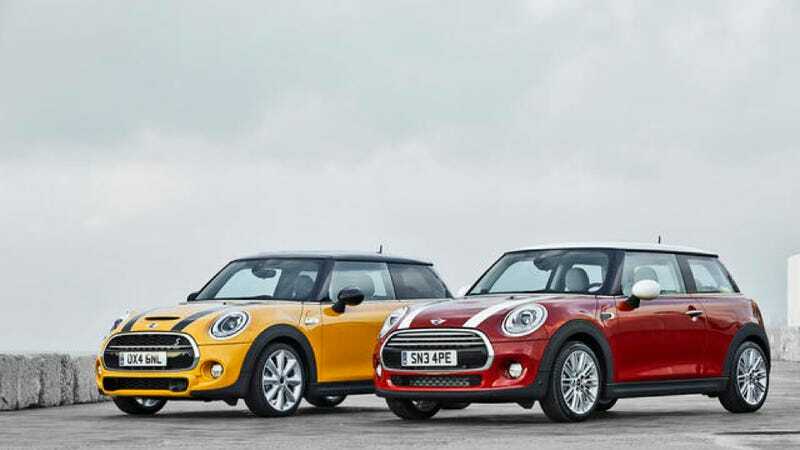 The 2014 Mini Cooper grows in every measurable dimension. It's 4.5 inches longer, 1.7 inches wider and a smidge taller. Just because all new cars need to grow slightly, apparently. Under the hood, the base Cooper gets a three cylinder engine with 134 horsepower and 162 pound feet or torques. That's right, the Mini is now mini under the hood, not on the outside. The Cooper S sticks with four cylinder power and has 189 horsepower and overboost to get 221 pund feet of torque. There is a six speed manual or automatic available for either. Also, the huge and pointless central speedometer is gone, replaced by a screen. That's fine with me. It might be tradition, but in this case, it's fine to get rid of it. It goes on sale in March, but we'll see the Mini in the flesh at the LA Show this week. Stay tuned. More info and photos in the launch, design, and specification press releases.